El desarrollo del vehículo comenzó en 1949 en la Oficina de Diseño de la Planta Kirov de Chelyabinsk bajo la supervisión de Joseph Kotin. En la etapa de diseño el vehículo fue recibió el nombre de Object 730. En 1950 se lanzó un lote de preproducción de 10 vehículos. En 1953, antes de que el tanque entrara en servicio, fue rebautizado como IS-8. El vehículo se adoptó para el servicio en la segunda mitad de 1953 bajo la designación T-10. El número de vehículos producidos varía de 2500 a 8000 dependiendo de las diferentes fuentes. The final development of the IS and KV series of tanks. 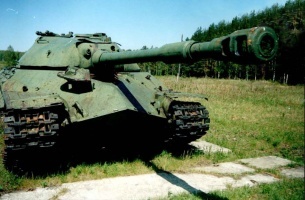 Originally known as the IS-10, it was later renamed the T-10 in the post-Stalin era. Designed in 1948, it was eventually produced between 1952-1966. Between 2,500 and 8,00 vehicles of this type were produced. The IS-8 should be played as a support Heavy, and opportunistic sniper. Its place is not on the front lines with the stronger heavies, such as the E-75 and ST-I, but in a more support role, and in the later stages of a battle, as an aggressive flanker. The IS-8, like many Heavies, works best from a side-scrape or hull-down position. If neither is available to the player, closing the distance between a lone enemy tank and the player, and adopting a face-hugging setup, is ideal. If in the open, the armour can not be relied upon to bounce shots. Ultimately, the IS-8 is a "high skill" tank. It is not user friendly, and only the dedicated tanker who plays to its strengths, can really draw out the exceptional qualities that the IS-8 offers. The 122mm BL-9 gun and the R-113 radio carry over from the IS-3 so immediately load those. The 122mm M62-T2 gun is the most important upgrade, but it is necessary to upgrade the suspension to the T-10M suspension before the gun can be mounted. Afterwards, research the V-12-6 engine to give the IS-8 its mobility, and then the T-10M turret.